Our sale containers and hire fleet containers can usually be delivered within 24 hours. Shipping containers that are more specialized, such as refrigerated storage containers, open top shipping containers or modified containers may require more planning and therefore time. Regardless of what shipping container type you require there are a few questions we will need to ask. How do you want to access the container? We need to know how you want to access the shipping container doors. This will ensure the portable storage container is loaded at our depot, so that the delivery is as efficient as possible. Where will the container be placed? To ensure the correct operation of your shipping container, it is best to ensure that your container sits on a level surface. An uneven surface may impede the operation of the doors. Uneven surfaces can also make delivery and unloading difficult. We suggest that you do your best to prepare the site prior to delivery, placing sleepers or concrete blocks down is a good idea. Is the delivery site safe and clear from obstructions? Your safety and our drivers safety is of paramount importance. So if there are any obstructions, such as overhanging trees or power lines, please tell us in advance. The best truck for the job? When discussing the delivery of your shipping container, we will need to decide on which type of truck will be best suited to your site. Below is an overview of the main truck types we use, and what they can do. Transport options vary depending on your container and circumstances. 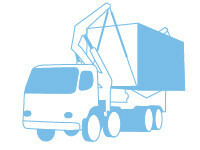 Tilt tray – the most cost effective form of delivery, contractors charge by the km. The shipping container is loaded on the truck, so that the container doors are in the correct position once delivered. The truck must reverse to the delivery point where the tray of the truck tilts to the ground & the portable storage container slides off the back. Ideal when there is good access. Empty and loaded containers. 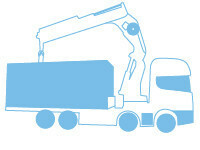 Crane truck – generally a premium charge, with contractors having an hourly rate instead of a km rate. Needed when the delivery locations are in a tight spot and obstacles need to be overcome. Empty containers only. 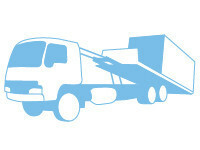 Side loader – contractors charge by the km. The side loader truck delivers the 40′ shipping container by picking it up from the trucks chassis at each end of the container & lowering it onto the site directly next to the trucks’ chassis. It is important to consider which way the container should be loaded onto the truck as it can only be unloaded from the right hand (drivers’) side.The shipping container can only be unloaded to the driver’s side of the vehicle. Ideal when there is good access. Empty and loaded containers. Super tilt – contractors charge by the km. The truck must reverse to the delivery point where the tray of the truck tilts to the ground & the 40′ shipping container slides off the back. Ideal when there is good access. Empty containers only.